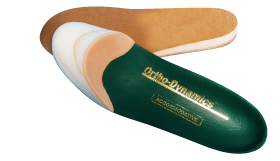 Ortho-Dynamics manufactures four (4) accommodative custom orthotics, which address amputee (toe prosthesis). Firm plastazode toe filler with a poron cushion liner. Only available on all leather style orthotics.